The top sub-dial shows sunrise yellow hand, sunset orange hand, moonrise light grey hand, and moonset dark grey hand as well as the current 24-hour time. The moon hands can be turned turned on and off in Settings. The moon is shown in its current phase. An arc around the moon indicates its current age and can be turned off in Settings. Note that the moon phase and age are only updated in roughly three-day increments unless you are using WU for WM which provides daily updates. A digital time display next to the top sub-dial can be turned on and off in Settings. The bottom sub-dial is the stopwatch with hands for hours, minutes, and seconds. When not reset there will also be digital displays that include hundredths. 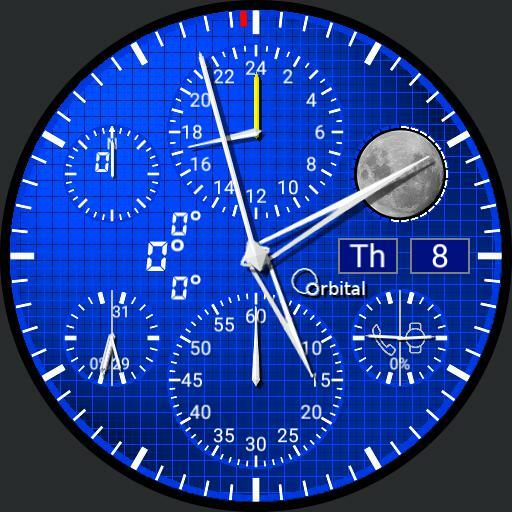 The lower right sub-dial shows charge levels for the watch and phone. The upper left sub-dial shows the wind direction. The upper digital inset indicates the wind speed and the lower if present the gust speed. The lower left sub-dial shows the relative humidity white hand and probability of precipitation hollow hand on the left and the air pressure on the right. The triangle to the right indicates the air pressure trend. The far left icon shows the forecast for the current day. You can choose between that and an icon for the current conditions in the Settings. A tiny "c" will appear above if it is showing current conditions. The icon turns yellow after an hour of weather update errors and red after four hours of errors. The inner left numbers show the forecast high and low on the top and bottom. In between to the left is the current temperature. The feelslike apparent temperature appears to the right if it is different. The feelslike temperature can be turned turned on and off in Settings. The degree symbol after the current temperature turns red if the feelslike temperature is higher than the current temperature and blue if it is lower. The red line on the outer dial indicates magnetic North. It can be turned on or off in Settings mode and is disabled by default for some watches. Tapping the top sub-dial switches tap modes from Normal to Stopwatch to Settings and back. Tapping the center will move the main hands to a position where all sub-dials and windows are unobstructed. Tapping the center again will move them back. The hands will resume their positions automatically after one minute. Tapping the bottom sub-dial will turn the whole watch display black. Tapping again will restore the display. In Stopwatch mode tapping the bottom sub-dial starts or stops and tapping the center resets. Under Settings you can choose different color combinations for the foreground and backgrounds. Features marked with an asterisk only appear when using Weather Underground for Watchmaker WU for WM.